NASBA has a long tradition of promoting family, education and trust. From its internal Education Reimbursement Program to donating money to cancer research, NASBA has a vested interest in its employees and their interests and efforts to better the local community. To further support and promote community outreach, NASBA launched a Community Reinvestment Committee in March of this year to formalize the process of support of charitable events or activities in which NASBA employees are active participants. Earlier this month, the Community Reinvestment Committee accepted a proposal to donate to Homes for Our Troops, a national non-profit organization founded in 2004 that is strongly committed to helping those who have selflessly given to our country and have returned home with serious disabilities and injuries since September 11, 2001. Homes for Our Troops is currently building two homes in the Nashville area for two heroes, Andrew Wilson and Ben Maenza. 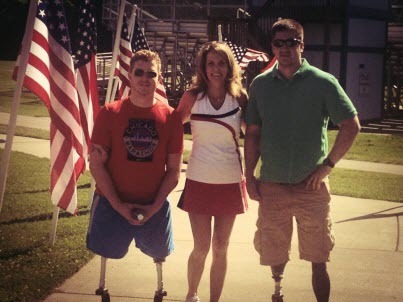 Both Wilson and Maenza suffered amputations to both of their legs due to injuries sustained while serving in Afghanistan. These deserving young men currently have specially-adapted homes being built for them, and all donations raised as part of their building projects are going directly to the construction of these homes. NASBA has pledged $1,000 to each of their building projects, in the hopes that the money will go a long way toward helping both men build a home worthy of their sacrifices for this country. NASBA President and CEO Ken Bishop said he is pleased and proud that the Community Reinvestment Committee has chosen to have NASBA support Homes for Our Troops. “We owe so much to these soldiers who have given so much to protect our freedom and way of life, so it is a tremendous privilege for NASBA to contribute to this great cause,” said Bishop. For more information on this great organization, please take a look at the Homes for Our Troops website.